Social 2 Search is a potentially unwanted application. More specifically, it is classified as adware by malware specialists. The main threat related with this application is its ads. They can be both commercial and non-commercial, in other words, they vary greatly in their content so that they would attract as many users as possible. The adware is made to be compatible with a lot of browsers (especially the ones that are used most widely): Mozilla Firefox, Internet Explorer, and Google Chrome. No matter which browser you have or use the most, the adware will haunt your browsing sessions with its intrusiveness. It is known that some users think that adware-type applications are useful in some ways. For example, there are people who want to know about various discounts and best shopping deals. They sometimes install adware applications by themselves. However, this is a huge mistake: soon enough, the ads show their dark side. 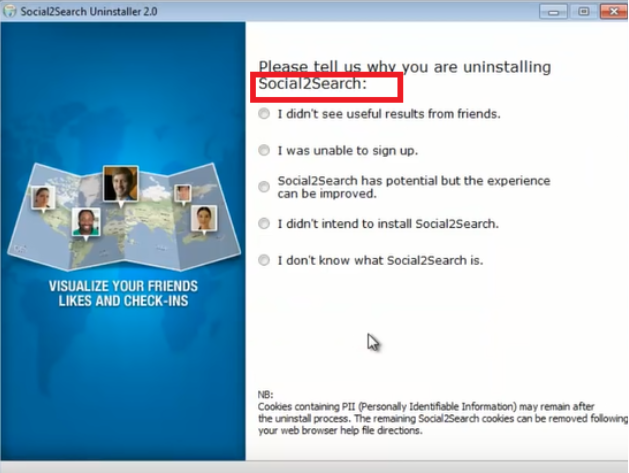 You have to uninstall Social 2 Search now for safety reasons. Why is Social 2 Search dangerous to my PC? If you do not remove Social 2 Search, your computer can get heavily infected with malware and viruses. This happens because the advertisements may redirect to dangerous pages online. Of course, some ads might be useful, but the majority of them is malicious. You must terminate Social 2 Search before you or your family members end up on corrupted websites. From such sites, various kinds of dangers can hijack your computer. For example, a threatening rogue anti-virus program might invade the system, or a deadly Trojan horse might infiltrate your PC without your notice. However, if you delete Social 2 Search soon enough, such threats may be avoided. You should keep in mind that while the potentially unwanted program resides on your system, you should not click on any ads you see on your computer screen. How did Social 2 Search attack my personal computer? The potentially unwanted program usually comes in free software bundles. If you have this adware, you may have some other threatening applications. If you want to get rid of all infections on your computer, you have to delete Social 2 Search alongside with all the other uninvited PUPs. The next time you download freeware and shareware, do not forget to mark the Custom or Advanced installation settings so that the list of all the programs could be seen. View the list and uncheck the unwanted applications. How to remove Social 2 Search from my computer? It is not that difficult to remove Social 2 Search. You see, a professional anti-malware and anti-spyware program is made to do this as quickly as possible. Also, the security tool should require no effort from your side regarding Social 2 Search removal. Even an inexperienced user can scan the computer and let the anti-virus program delete all the viruses, malware, and potentially unwanted programs.